Windows 10 is slowly adding on more big-name universal apps. The most recent one of these is Dropbox, which includes some useful features to pull you away from the Web interface. The app looks sleek and minimal, taking advantage of Microsoft’s universal app platform (meaning it can be easily adapted to work on phones) for a minimal touch-friendly interface. The most interesting new feature is Windows Hello support, meaning you can basically secure your files with your face, fingerprint, or iris (depending on your device’s hardware). Using Windows Hello with my face, it’s a fair bit quicker than typing in my password every time, while being more secure than simply having the app remember my log in info. Quick search – No need to click the search icon, just start typing and the app will begin looking up files. 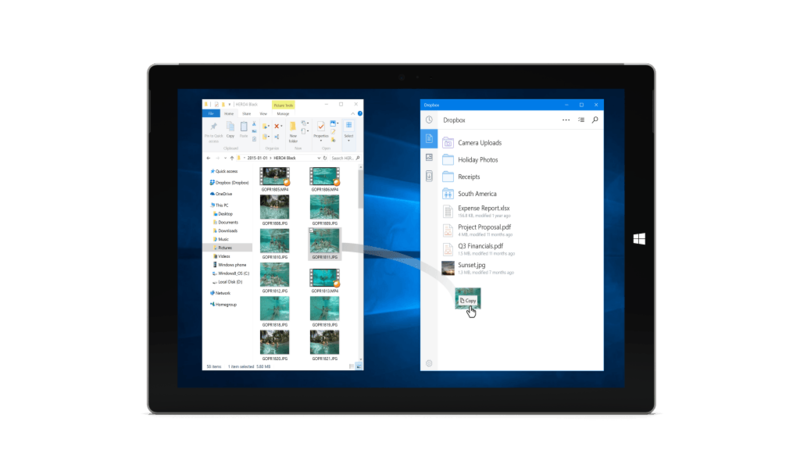 There’s a lot of functionality here for a universal Windows app, and the touch-friendliness certainly doesn’t hurt if you’re on a tablet, so it’s worth using over the Web interface. The app is rolling out to the Windows Store throughout the week, while a phone-optimized version will be coming soon.